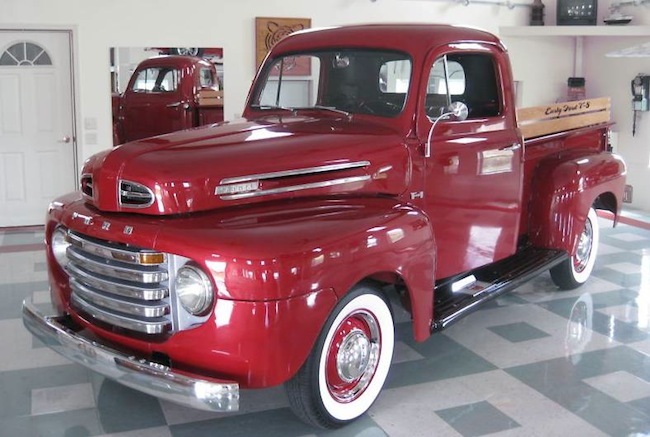 The 1949 Ford F-Series is very similar to the 1948 Ford Truck. Available models include the F-1 half ton, the F-2 three quarter ton, and the F-3, the heavy duty truck. Like the '48 trucks, on the front of the hood there were two "grille" openings. You opened the hood by pulling on the passenger side center bar. The driver side bar is fixed. 24 Head bolts, 2 barrel Ford-Holley carburetor. The 1948-1952 Ford pickups are a popular choice for truck enthusiasts who like to restore classic trucks. 1949 Ford Trucks were built in Michigan at the Highland Park Ford plant. The serial and the engine numbers are the same on 1949 F-Series trucks and are located on the glove box door and on the top left side of the frame near the steering gear. All photos of the red '49 Ford F-1 shown on this page are used with permission from Brian Page (fairportboss).